RIP1 (RIPK1) kinase is a key regulator of TNF-induced NF-κB activation, apoptosis, and necroptosis through its kinase and scaffolding activities. Dissecting the balance of RIP1 kinase activity and scaffolding function in vivo during development and TNF-dependent inflammation has been hampered by the perinatal lethality of RIP1-deficient mice. In this study, we generated RIP1 kinase–dead (Ripk1K45A) mice and showed they are viable and healthy, indicating that the kinase activity of RIP1, but not its scaffolding function, is dispensable for viability and homeostasis. After validating that the Ripk1K45A mice were specifically protected against necroptotic stimuli in vitro and in vivo, we crossed them with SHARPIN-deficient cpdm mice, which develop severe skin and multiorgan inflammation that has been hypothesized to be mediated by TNF-dependent apoptosis and/or necroptosis. Remarkably, crossing Ripk1K45A mice with the cpdm strain protected against all cpdm-related pathology. Together, these data suggest that RIP1 kinase represents an attractive therapeutic target for TNF-driven inflammatory diseases. Tumor necrosis factor is a pleiotropic cytokine that was first described as causing necrosis in tumors (1), but it has since been recognized as a major driver of inflammation and human disease pathogenesis (2). TNF binding to its receptor, TNFR1, results in one of three distinct cellular fates: NF-κB activation, apoptosis, or necrosis. The serine/threonine kinase RIP1 serves as a key decision checkpoint for these different fates through its function as a scaffolding protein and its kinase activity (3). Under conditions in which RIP1 is highly ubiquitinated, TNFR1 engagement activates NF-κB to promote gene transcription and cell survival. In situations in which RIP1 is deubiquitinated, TNF initiates one of two programmed cell death pathways: apoptosis or the recently discovered necroptosis pathway that requires conditions of caspase inhibition (4). In vitro experiments using the RIP1 kinase inhibitor necrostatin-1 (Nec-1) showed that RIP1 kinase activity is critical for TNF-induced necroptosis, but it appears dispensable for NF-κB activation and apoptosis (5). However, the exact contribution of RIP1 kinase activity to viability, homeostasis, and inflammation in vivo is unknown because RIP1-deficient mice die shortly after birth (6), and current pharmacological tools are unsuitable for chronic RIP1 inhibition (5). TNFR1-mediated activation of NF-κB is dependent upon the ubiquitination of RIP1 by the linear ubiquitin chain assembly complex (LUBAC), which consists of the enzymes HOIL, HOIP, and SHARPIN (7). Cells lacking LUBAC function through deficiency of SHARPIN show no detectable NF-κB activation following TNF stimulation, but they are highly sensitive to TNF-induced apoptosis and RIP1 kinase–dependent necroptosis (8). SHARPIN-deficient, cpdm mice develop a TNF-dependent multiorgan inflammatory pathology including a severe dermatitis (9). The in vitro data suggest that development of inflammation in cpdm mice is likely mediated by excessive TNF-dependent apoptosis and/or necroptosis. Both apoptosis and necroptosis have been implicated in driving inflammation in disease settings; therefore, the precise contributions of these cell death pathways in the pathogenesis of disease in the cpdm mouse remain unknown. In this study, we generated RIP1 kinase–dead (Ripk1K45A) mice and showed that they are viable and healthy. Ripk1K45A mice showed a selective defect in TNF-induced necroptosis in vitro and were resistant to a lethal TNF-dependent shock in vivo. 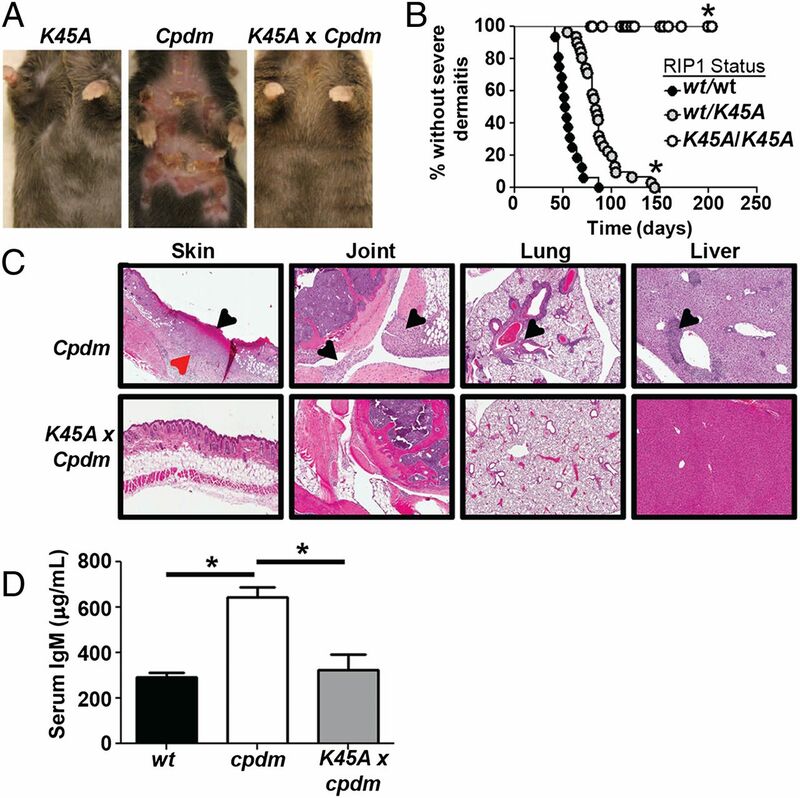 Crossing Ripk1K45A mice with the cpdm line completely rescued the skin and tissue inflammatory pathology, highlighting the inflammatory potential of RIP1 kinase–dependent cell death and signaling in TNF-driven diseases. RIP1 kinase-dead knock-in (Ripk1K45A) mice were generated as described (Fig. 1A). Additional information is available upon request. Cpdm mice were purchased from The Jackson Laboratory. All animal procedures were conducted in an American Association for the Accreditation of Laboratory Animal Care–accredited facility at GlaxoSmithKline in accordance with the GlaxoSmithKline Policy on the Care, Welfare, and Treatment of Laboratory Animals, and they were reviewed and approved by the Institutional Animal Care and Use Committee at GlaxoSmithKline. Bone marrow–derived macrophages (BMDMs) were prepared from bone marrow by differentiation with 10 ng/ml M-CSF (R&D Systems). Thioglycollate-elicited peritoneal macrophages (TMs) were obtained from mice that had been injected with 1.5 ml 4% thioglycollate (Difco). Cytokines were measured using the Mouse Proinflammatory 7-Plex Ultra-Sensitive kit (Meso Scale Discovery). Serum IgM was measured by ELISA (eBioscience). To examine protein expression in tissues, lysates were run on SDS-PAGE and blotted onto nitrocellulose membranes (Invitrogen). Blots were probed for β-actin (Sigma), RIP1 (BD Biosciences), and RIP3 (Imgenex). For TNF-activation experiments, BMDMs were treated with 50 ng/ml TNF (R&D Systems), and lysates were separated by SDS-PAGE and blotted onto a nitrocellulose membrane (Invitrogen). Blots were probed for IκB, phospho-IκB, tubulin, phospho-p38, total p38, phospho-JNK, and total JNK (all from Cell Signaling), as well as for phospho-ERK and total ERK (both from Santa Cruz Biotechnology). BMDMs were treated for 2, 4, or 6 h with TNF and zVAD. Total RNA was isolated using an RNeasy Mini kit (QIAGEN). cDNA was generated using TaqMan Reverse Transcription Reagents, and gene expression was evaluated with the TaqMan PCR Core Reagent Kit, using the commercially available KC primer/probe set (all from Invitrogen; Mm 04207460_m1). Data were normalized to 18S rRNA. Phospho-RIP1 ELISAs were performed on lysates produced from TNF-stimulated (20 ng/ml) or TNF + zVAD–stimulated (20 μM; R&D Systems) TMs using MULTI-ARRAY 96-well small spot plates (Meso Scale Discovery) coated with anti-human RIP1 Ab (Abcam). Lysate samples were incubated, and phospho-RIP1 was detected with a novel rabbit anti-RIP1pS166 Ab (J. Finger, M. Cook, J. Bertin, and P.J. Gough, manuscript in preparation) and an anti-rabbit IgG, SULFO-tagged detection Ab (Meso Scale Discovery). Plates were read on a SECTOR Imager 6000, and ECL counts were converted to nanograms using the standard curve. Tissues for histologic examination were collected, immersion fixed, trimmed, decalcified (where applicable) until judged complete by palpation, and processed. Following fixation, tissue samples were embedded in paraffin wax, sectioned, stained with H&E, and examined by light microscopy. Necroptotic and apoptotic cell death were induced by treatment with TNF (50 ng/ml BMDMs and 10 ng/ml TMs) and zVAD (50 μM BMDMs and 20 μM TMs) or TNF (50 ng/ml) and cycloheximide (CHX; 12 μg/ml; Sigma), respectively. Cell death evaluation was performed 21 h poststimulation by quantifying intracellular ATP levels using a CellTiter-Glo Viability assay (CTG; Promega). Percentage survival was calculated for each treatment (TNF-treated cells were set to 100% survival). For caspase 3/7 activity, cells were treated with TNF and CHX for 6 h. Activity was measured using the Caspase-Glo 3/7 assay (Promega). Data were normalized for protein levels. Supernatants were collected for cytokine analysis. Mice were injected i.v. with 1.25 mg/kg TNF (Cell Sciences) and 16.7 mg/kg zVAD (Bachem). Temperature was monitored at regular intervals using a rectal probe. Mice were euthanized once a 7°C temperature loss from baseline was detected, in accordance with our Institutional Animal Care and Use Committee protocol. Cpdm mice and crosses were monitored by our veterinary staff and euthanized when the dermatitis was considered severe (covering ≥50% of the abdomen). Tissues were collected for histopathology. In vitro data are shown as mean ± SD. In vivo data are shown as mean ± SEM and were analyzed using one-way ANOVA, followed by Bonferroni post hoc analysis. Cpdm dermatitis data were analyzed by the Log-rank (Mantel–Cox) test. To study the role of RIP1 kinase activity in TNF signaling, we generated a kinase-dead knock-in (Ripk1K45A) mouse with a point mutation in the catalytic lysine (K45A) in exon 3 of the Ripk1 gene (Fig. 1A). Ripk1K45A mice were viable and born at the expected Mendelian ratios from interbreeding of heterozygous mice, and they displayed normal litter sizes from homozygous breeding paradigms (data not shown). A similar RIP1 kinase–dead mouse with a D138N mutation was published while this manuscript was under review; it also was shown to be viable and to have a phenotype similar to our Ripk1K45A mice (10). This is in contrast to mice lacking RIP1 protein (RIP1 knockout [KO]), which die 1–3 d after birth (6). We confirmed the previously reported RIP1 KO phenotype, because exon 3 of our Ripk1K45A construct was flanked by loxP sites (Fig. 1A), and no RIP1 KO homozygous mice were observed at weaning when knocking out the gene by crossing with a Cre/loxP-deleter–transgenic line (data not shown). Ripk1K45A mice are viable and lack pathology associated with the RIP1 KO mouse. (A) The Ripk1 gene-targeting vector was constructed from genomic C57BL/6 mouse DNA. The K45A point mutation was inserted into Ripk1 exon 3, whereas a Neo cassette was inserted in intron 3 flanked by FRT sites for Flp-mediated excision. Exon 3 was flanked by loxP sites, enabling access to its deletion through Cre action. (B) Phospho-RIP1 ELISA analysis. Lysates were prepared from wt or Ripk1K45A macrophages (control) or from cells stimulated with TNF or TNF and zVAD for 3 h. Results are representative of two experiments. (C) Western blot analyses of RIP1 and RIP3 expression in the spleen, thymus, and lymph nodes (LN) from wt and Ripk1K45A mice. β-Actin is shown as a loading control. Data are representative of three experiments. (D) Histopathology analysis of spleen, thymus, and white adipose tissue from 10–12 wk-old wt littermate and Ripk1K45A mice. H&E staining, original magnification ×20. Data are representative of three wt and five Ripk1K45A mice. To confirm that Ripk1K45A mice lacked kinase activity, we used a newly generated Ab recognizing an autophosphorylation site on RIP1 (J. Finger, M. Cook, J. Bertin, and P.J. Gough, manuscript in preparation). Phospho-ELISA analysis detected RIP1 autophosphorylation in response to TNF and zVAD stimulation of cells from wild-type (wt), but not Ripk1K45A, littermate controls (Fig. 1B). Despite lacking kinase activity, protein expression of RIP1 and its necroptosis-inducing partner, RIP3 (11), were normal in multiple tissues and cell types including spleen, thymus, lymph nodes, and macrophages (Fig. 1C, data not shown). A thorough histopathological analysis was undertaken to explore whether the absence of kinase activity led to any pathologies, despite the mice appearing grossly normal. Ripk1K45A mice were histologically indistinguishable from wt mice in any of the 20 tissues examined (Fig. 1D). This included organs in which pathologies were observed in RIP1 KO mice when they were originally described (6). Additionally, no differences were observed in thymic double-positive T cell populations between wt and Ripk1K45A mice (Supplemental Fig. 1). This contrasts with the defect in this population that was seen in RIP1 KO mice (6). 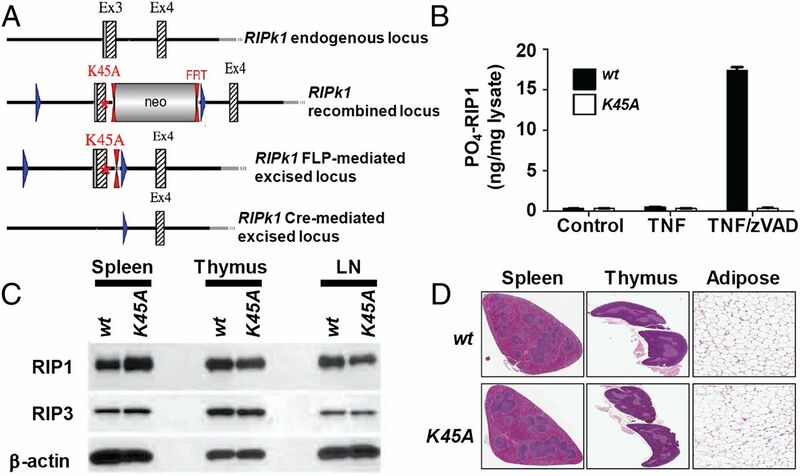 By demonstrating that Ripk1K45A mice lacking RIP1 kinase activity are viable and healthy, we can attribute the perinatal lethality of the RIP1-deficient mice to an absence of RIP1 scaffolding function. We next set out to address which pathways downstream of TNFR1 were affected by the lack of RIP1 kinase activity in vitro. To this end, BMDMs and TMs were isolated from Ripk1K45A mice or wt littermate controls and stimulated with TNF and the caspase inhibitor zVAD to induce necroptosis. Ripk1K45A macrophages were completely protected from undergoing this form of cell death (Fig. 2A). In addition to being protected from cell death, Ripk1K45A macrophages showed diminished production of the chemokine KC compared with wt controls (Fig. 2B), consistent with an emerging role for RIP1 kinase activity in the generation of inflammatory cytokines (12). 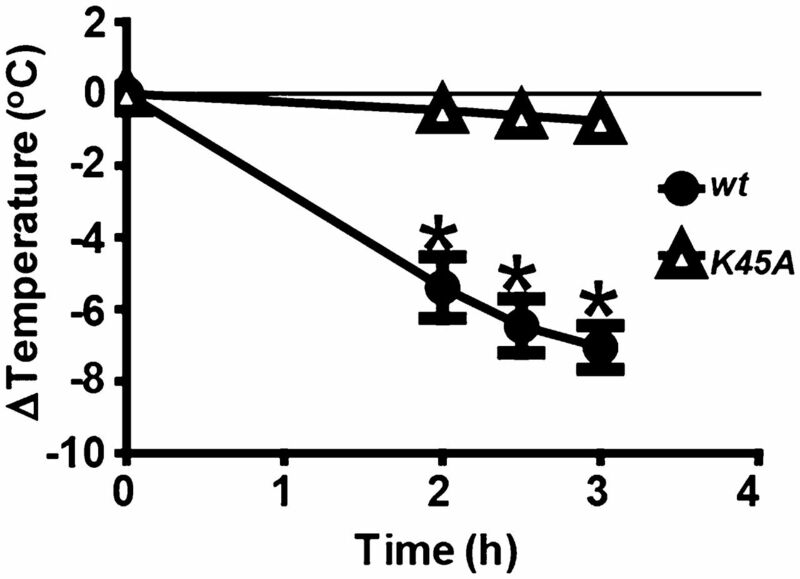 Further investigation revealed that this RIP1-dependent cytokine production was likely to be regulated at the mRNA level, because wt mice showed roughly 2-fold higher levels of KC mRNA at 2 h poststimulation, which preceded RIP1 dependence at the protein level (i.e., not seen until 4 h poststimulation) (Fig. 2C). Macrophages from Ripk1K45A mice are protected from necroptosis but not NF-κB activation or apoptosis in vitro. (A) CTG viability analysis of BMDMs or TMs from wt or Ripk1K45A mice. Macrophages were left untreated (control) or stimulated with TNF and zVAD. (B) Measurement of KC release from BMDMs treated as in (A). (C) KC mRNA and protein analysis from BMDMs from wt or Ripk1K45A mice treated with TNF and zVAD for the indicated times. (D) CTG viability analysis of BMDMs from wt or Ripk1K45A mice. Macrophages were either left untreated (control) or stimulated with TNF or TNF and CHX for 21 h. (E) Measurement of KC release from BMDMs treated as in (D). We next examined the effect of the absence of RIP1 kinase activity on TNF stimulation of the NF-κB pathway and apoptosis. TNF stimulation resulted in an equal prosurvival signal (Fig. 2D) and cytokine production (Fig. 2E) in Ripk1K45A and wt control macrophages. Similarly, Ripk1K45A and wt control cells were equally susceptible to TNF and CHX–induced apoptosis (Fig. 2D) and KC production (Fig. 2E). This lack of an effect on TNF-alone signaling was confirmed by examining TNF-driven IκB phosphorylation and degradation (Supplemental Fig. 2A) and p38, JNK, or ERK activation out to 2 h post-TNF challenge (Supplemental Fig. 2B, data not shown). Similarly, TNF and CHX–induced caspase 3/7 activation was also unchanged (Supplemental Fig. 2C). Together, these results show that cells from Ripk1K45A mice are selectively protected against RIP1 kinase–dependent cell death and signaling, in agreement with experiments using the RIP1 inhibitor Nec-1, as well as RIP3-deficient cells (5, 13). We next assessed the contribution of kinase activity in vivo. Previous work showed that the administration of TNF and zVAD in vivo results in a shock-like syndrome that is characterized by temperature loss, inflammatory cytokine production, and death (14). This temperature loss was shown to be partially rescued by blocking the necroptosis pathway through administration of the RIP1 kinase inhibitor Nec-1 or absence of the RIP3 protein (14). To follow up on these observations, TNF and zVAD were dosed to Ripk1K45A or wt control mice. Wt mice lost 7°C, on average, 3 h postinjection, whereas Ripk1K45A mice were nearly completely resistant to the challenge, losing <1°C 3 h postinjection (Fig. 3) and surviving to termination of the study at 24 h postchallenge with no signs of morbidity (data not shown). The near-complete protection from temperature loss in Ripk1K45A mice contrasts with only a partial protection in mice treated with Nec-1. This may be best explained by incomplete blockade of RIP1 kinase activity with Nec-1, because compounds with better potency and pharmacokinetics can completely block TNF and zVAD–induced temperature loss (S.B. Berger, J. Bertin, and P.J. Gough, manuscript in preparation). Additionally, this discrepancy in the level of protection between Ripk1K45A and RIP3 KO mice suggest that RIP1 kinase–dependent, RIP3-independent mechanisms may be involved in driving pathology in the model. 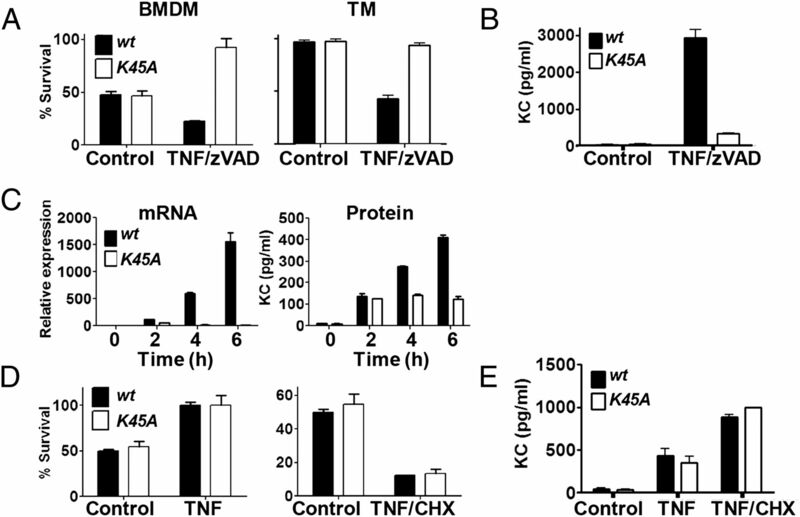 Ripk1K45A mice are protected from TNF and zVAD–induced shock. Wt or Ripk1K45A mice were injected with TNF and zVAD. Temperature was monitored over 3 h, and animals were euthanized after a 7°C loss. Data are representative of at least three experiments, each containing seven mice/group. *p ≤ 0.05. We next crossed the cpdm strain with Ripk1K45A mice to understand the involvement of RIP1 kinase activity in driving the cpdm inflammatory phenotypes. Cpdm mice develop a severe dermatitis beginning at 6–8 wk of age (Fig. 4A). Ripk1K45A heterozygous SHARPIN-deficient mice showed a small, but significant, delay in the onset of the severe dermatitis (Fig. 4B). Remarkably, cross of the cpdm strain with a Ripk1K45A homozygous background resulted in complete protection from the dermatitis phenotype (Fig. 4A, 4B). In addition to the dermatitis, histopathological examination of cpdm mice showed prominent inflammation in multiple tissues, including skin, joint spaces, lung, and liver (Fig. 4C). Histopathology changes consisted chiefly of multifocal to diffuse areas of inflammatory cell infiltration and edema and localized epidermal ulceration and/or epidermal keratinocyte degeneration in the skin and inflammation of synovial membranes, along with hyperplasia of the synovial epithelium in the joints (Fig. 4C). Additionally, lung inflammation was associated with interstitial peribronchiolar/peribronchial and perivascular areas, whereas multifocal inflammation, with or without fibrosis, was observed in the liver (Fig. 4C). Absence of RIP1 kinase activity protected against all cpdm-related inflammatory phenotypes at the histopathological level, with tissues being indistinguishable from those of non-cpdm mice (Fig. 4C). Furthermore, compared with wt littermate controls, cpdm mice also display an increase in serum IgM levels that is completely reversed in Ripk1K45A homozygous cpdm mice (Fig. 4D). RIP1 kinase activity drives inflammation in cpdm mice. (A) Representative photomicrographs of Ripk1K45A, cpdm, and Ripk1K45A × cpdm mice at 7–8 wk of age. (B) Cpdm and Ripk1K45A heterozygous mice were interbred to produce cpdm mice that were wt (wt/wt), heterozygous (wt/K45A), or homozygous (K45A/K45A) for the Ripk1K45A gene. Dermatitis was considered severe (covering ≥50% of the abdomen). *p ≤ 0.05, versus RIP1 wt/wt group. (C) Representative histology from cpdm or Ripk1K45A × cpdm mice at 7–8 wk of age. Arrowheads point to epidermal ulceration (black arrowhead) and dermal inflammation (red arrowhead) in skin, regions of inflammation in joint, regions of inflammation in lung, and areas of inflammation in the liver. (D) Analysis of serum IgM levels. H&E staining, original magnification ×20. *p ≤ 0.05. Given the selective protection of cells from Ripk1K45A mice to TNF-induced necroptosis, this makes the complete rescue observed in cpdm × Ripk1K45A mice, which are sensitive to both TNF-mediated necroptosis and apoptosis, surprising. This may highlight the potent inflammatory nature of necroptotic cell death; alternatively, these results are consistent with emerging data suggesting that RIP1 kinase activity also can drive an apoptotic response under certain conditions (15). Together, these results show that the inflammatory phenotype of cpdm mice is entirely RIP1 kinase dependent. The absence of another LUBAC family member, HOIL, was shown to cause autoinflammation and immunodeficiency in humans (16). Although these patients do not develop dermatitis, in some cases the inflammation was completely TNF-dependent (16). This makes it tempting to speculate that, similarly to the SHARPIN-deficient mouse, many of the pathologies observed in HOIL-deficient patients are driven by aberrant RIP1 kinase activity. Our data highlight the usefulness of Ripk1K45A mice as a tool to dissect the role of RIP1-dependent necroptosis and signaling in mediating inflammation driven by TNF and other factors that stimulate the RIP1 kinase pathway. Our data showing that RIP1 kinase activity completely rescues inflammation in the cpdm mouse add to the growing body of evidence that RIP1 kinase–dependent cell death and signaling are highly inflammatory (17). These data, coupled with the lack of pathology in the absence of RIP1 kinase signaling, make RIP1 kinase an attractive target for the treatment of complex inflammatory diseases. All authors, with the exception of W.J.K. and E.S.M., are employees of GlaxoSmithKline. We thank Drs. Amber Anderson and David Cooper for help with statistical analyses, Angela Dykon and Dr. Sean Maguire for help with animal care, and Jon Renninger for help with coordinating the histopathology. This work was supported by the National Institutes of Health (Public Health Service Grants R01 AI20211 [to E.S.M.] and DP1 OD012198 [to W.J.K.]).
. 1975. An endotoxin-induced serum factor that causes necrosis of tumors. Proc. Natl. Acad. Sci. USA 72: 3666–3670.
. 2012. Historical perspectives on tumor necrosis factor and its superfamily: 25 years later, a golden journey. Blood 119: 651–665.
. 2007. RIP1, a kinase on the crossroads of a cell’s decision to live or die. Cell Death Differ. 14: 400–410.
. 2010. The role of the kinases RIP1 and RIP3 in TNF-induced necrosis. Sci. Signal. 3: re4.
. 2008. Identification of RIP1 kinase as a specific cellular target of necrostatins. Nat. Chem. Biol. 4: 313–321.
. 1998. The death domain kinase RIP mediates the TNF-induced NF-kappaB signal. Immunity 8: 297–303.
. 2011. The emerging role of linear ubiquitination in cell signaling. Sci. Signal. 4: re5.
. 2011. Linear ubiquitination prevents inflammation and regulates immune signalling. Nature 471: 591–596.
. 1993. A spontaneous mutation characterized by chronic proliferative dermatitis in C57BL mice. Am. J. Pathol. 143: 972–982.
. 2014. Activity of protein kinase RIPK3 determines whether cells die by necroptosis or apoptosis. Science 343: 1357–1360.
. 2012. RIP3 finds partners in crime. Cell 148: 17–18.
. 2012. A novel role for RIP1 kinase in mediating TNFα production. Cell Death Dis. 3: e320.
. 2009. Receptor interacting protein kinase-3 determines cellular necrotic response to TNF-alpha. Cell 137: 1100–1111.
. 2011. RIP kinase-dependent necrosis drives lethal systemic inflammatory response syndrome. Immunity 35: 908–918. , D. von Schweinitz, R. Humphreys, and S. Fulda. 2013. RIP1 is required for IAP inhibitor-mediated sensitization for TRAIL-induced apoptosis via a RIP1/FADD/caspase-8 cell death complex. Oncogene. 32: 3263–3273.
. 2012. Immunodeficiency, autoinflammation and amylopectinosis in humans with inherited HOIL-1 and LUBAC deficiency. Nat. Immunol. 13: 1178–1186.
. 2011. FADD prevents RIP3-mediated epithelial cell necrosis and chronic intestinal inflammation. Nature 477: 330–334.